Standard demographic targeting has been available to advertisers using the Google ecosystem for quite a while now. But recently, Google rather quietly expanded its demographic offering - ‘Detailed Demographics’. It used to be that you could target advertising based on standard demographics like age, gender and location. Useful, but limiting too. 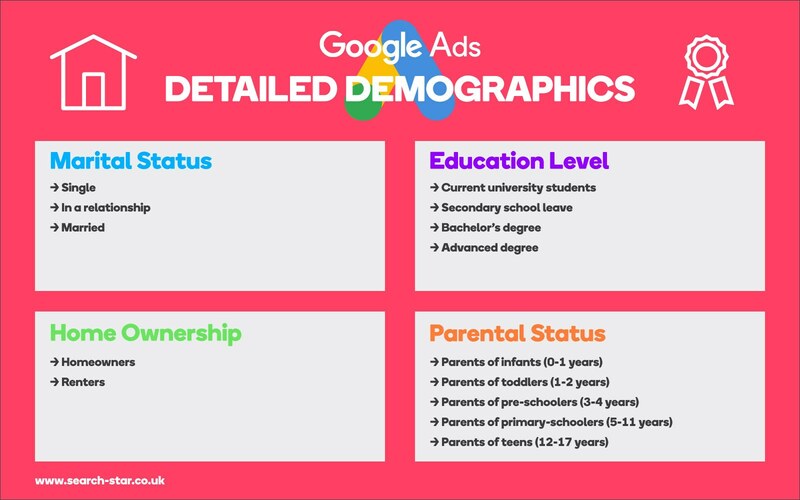 Now, with Google’s new Detailed Demographics, advertisers can specifically target based on education, parental status, home ownership and marital status. Advertisers can, as expected, use this data to create demographic-specific bid adjustments, exclude demographics from ads, and target far more granular demographics in search campaigns. How Do I Access Detailed Demographics? Why Should I Use Detailed Demographics? Standard demographic options are great for optimising your accounts. They can improve the quality of traffic you receive and reduce spend wastage. The benefit of having this new data at your fingertips is that you can tighten up your targeting even further and learn more about your customers. We have been overlaying audiences, initially with no bid adjustments, to monitor how they perform. The new granular audiences have been performing really well and generating CPAs lower than the account average. For instance, these new audiences will help to advertise products or services aimed at younger demographics. Until now age demographics have started at 18, meaning that if you had a product targeting 5-11 year olds there was no way to target them specifically. With the new audiences, we can actively target the parents - the decision makers - of primary school children. Similarly, targeting products regarding home improvement will naturally be more relevant to homeowners than renters. This means we can streamline our advertising and save money. The screenshot above shows all of the detailed demographic audiences being used by a tourist attraction. The average CPA for these audiences is now 52% lower than the account average, which is vastly improving account efficiency. Our recommendation, as with any big account changes, would be to run these audiences for a month before making a decision on bid adjustments. It’s also worth noting that you can also add them as exclusions to ensure your ads don’t show for the users which fall within the audience definitions.